New Zealand qualified for the World Cup quarter-finals with an underwhelming win over a committed Georgia. As expected, the defending champions had too much for Georgia in the first meeting between the sides, scoring seven tries, but errors cost them more. 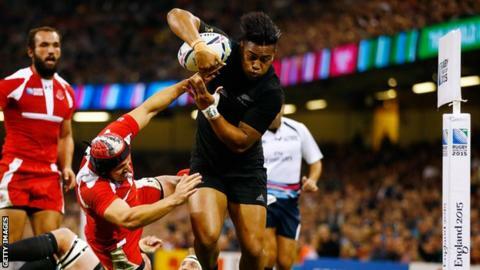 Julian Savea scored a hat-trick, with Waisake Naholo, Dane Coles, Kieran Read and Malakai Fekitoa also touching down. New Zealand top Pool C, eight points clear of Tonga, who face third-placed Argentina in Leicester on Sunday. The All Blacks' win is their 10th in a row in the World Cup, equalling their best ever run, which saw them go undefeated to win the inaugural event in 1987 before losing to Australia in the semi-finals in 1991. This current series of results stretches back to the start of their victorious 2011 campaign and includes their three Pool C wins in the current competition, over Argentina, Namibia and now Georgia. At times on Friday, they produced some scintillating, flowing rugby but often their ambitions exceeded their execution, with 18 handling errors and some uncharacteristically poor kicking from Dan Carter - who missed three of his first four conversions - costing them points against a hard-hitting but limited Georgia side. However, the holders still managed to secure the bonus point just after the 20-minute mark courtesy of a superb solo effort from Naholo, Savea's double and Coles finishing off a wonderful passing move. There was more frustration for New Zealand in the second half, including the loss of influential captain Richie McCaw, who limped off after an hour. Read's close-range score was the only addition to their tally before Savea collected in space out wide to complete his hat-trick and replacement Fekitoa out-stripped the Georgia defence to go over in the last 10 minutes. One of 10 changes by the All Blacks, winger Naholo was back in the side for the first time since suffering a hairline fracture to his fibula 50 minutes into his debut, against Argentina in the Rugby Championship on 17 July. He showed no signs of rustiness, showing superb pace and power to break a series of attempted tackles to score the opening try in just the second minute. Understandably, he did not last the full game, departing in the 52nd minute, but his opening salvo further underlines the attacking talent the All Blacks have at their disposal. Georgia made 11 changes to the side that lost 54-9 to Argentina a week ago as they focus on trying to win their last pool game against Namibia on 7 October but Milton Haig's chosen men did he and their country proud. They were disciplined in defence, hit hard and pressurised the All Blacks throughout. Their reward came in the shape of the early try from Tsiklauri, who collected his own opportunistic kick and ran clear to score his country's 12th, and most significant, World Cup try. In addition, the biggest cheer of the night greeted the announcement of Mamuka Gorgodze as man of the match for his battling contribution to an impressive Georgia display. New Zealand: B. Smith, Naholo, C. Smith, Williams, Savea, Carter, A. Smith, Crockett, Coles, Faumuina, Retallick, Whitelock, Kaino, McCaw, Read, Perenara. Replacements: Fekitoa for Naholo (53), Vito for Williams (57), Perenara for A. Smith (71), Woodcock for Crockett (61), Mealamu for Coles (71), O. Franks for Faumuina (61), Cane for McCaw (61), Kerr-Barlow for Perenara (76). Tries: Naholo, Savea 3, Coles, Read, Fekitoa. Georgia: Tsiklauri, Aptsiauri, Kacharava, Mchedlidze, Todua, Malaguradze, Begadze, Asieshvili, Mamukashvilli, Chilachava, Chkhaidze, Datunashvili, Sutiashvili, Gorgodze, Lomidze. Replacements: Giorgadze for Mchedlidze (76), Maisuradze for Todua (66), Lobzhanidze for Begadze (45), Nariashvili for Asieshvili (51), Sharikadze for Mamukashvilli (66), Peikrishvili for Chilachava (51), Mikautadze for Gorgodze (48), Kolelishvili for Lomidze (68).